Description of symmetries: There are vertical, horizontal, and diagonal reflection mirrors at 45 degree angles as shown. These mirrors are also glide mirrors. 4-fold dihedral rotation centers are located at the intersection of four mirror lines. 2-fold dihedral rotation centers are located at the intersection of two diagonal mirror lines. The shortest translation vectors are twice the distance between the diagonal mirrors. The shortest glide vectors horizontally and vertically are twice the distance between the horizontal and vertical mirrors. Description of fundamental region: The fundamental region is a 45-45-90 right triangle. Description of symmetries in block: Technically, this quilt does not have blocks as it was purchased with the pattern printed on it. However, this quilt can be hand-pieced and a block would have *4 symmetry. Relationship between block and fundamental region: A block is approximately 16 fundamental regions. 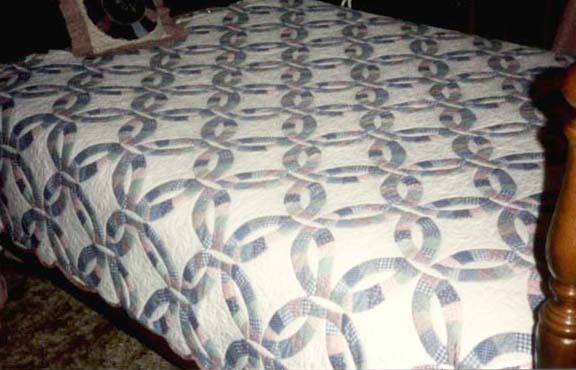 Description of symmetries in quilting: The quilter 'traced' the pattern of the quilt, embellishing it by quilting a flower design in the center of the 'circles'. Thus, the quilting symmetry is not in harmony with the quilt symmetry. 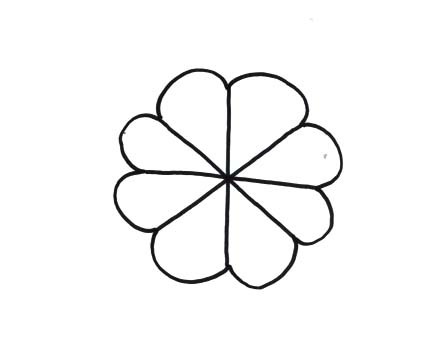 For an analysis of the quilted flower design, see below. To see entire quilt, scroll up to the top.